Benifits of Sheep Scanning | Sheep & Cow scanning, Scanning av får. Getting the empty ewes out of the flock early in the winter to ease up the feed needed to carry the productive stock through. Being able to draft the ewes before lambing into mobs of ewes carrying a single lamb, ewes carrying twin lambs and in some cases those ewes with triplets. Why? Feed requirements. Those ewes carrying only one lamb need much less feed during late winter than ewes carrying twins/triplets. It has also proven to be very popular to draft off the late lambing ewes. This could be the ewes that are mated a month after the rams are introduced or in some cases after the first cycle. By keeping the ewes with singles separate on the colder harder country, and at a potentially higher stocking rate, the warmer country can be used for ewes with multiple lambs at a lower stocking rate. This has been proven to boost lamb survival by up to 20%. If the winter is difficult then the ewes can be separated earlier into single/multiple mobs with the twins getting first pick and the singles cleaning up. During serious drought years some farmers have sold ewes carrying two lambs as there chances of surviving spring with very little feed even at a low stocking rate is not as good as a ewe with one lamb. Keeping ewes separate is also an advantage when it comes to shedding a night pen for crutching. Putting ewes with singles in over night, and bringing the ewes with twins in during the day, has the advantage of ewes with twins not hanging around to long. This will help to keep the stress on the animal down and reduce the chances of sleepy sickness. After lambing it can be an advantage when docking knowing which paddocks have singles in and which have twins. Those with singles can be left to fill in the day as they muster easier, mother-up easier and take a lot less time to dock. 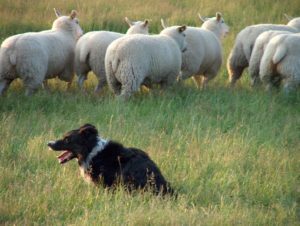 One advantage with scanning that many people seem to have misunderstood is that of only keeping replacements from the twin ewe lambs. This can work well and while progress is slow it is still a good idea to select replacements from the better twin born ewe lambs. But in most large scale farming situations it can be silly to keep poorer twin born ewe lambs over good single lambs. A lamb born a single should have inherited half its genetic potential from the ram. It is also highly likely that a ewe that had a single this year had two lambs last year. As people become more aware of their flocks potential and management skills improve, the ability of a ewe to produce 2 or more lambs year after year increases due to those ewes carrying multiple lambs being feed better before lambing. They can then better cope with the demands of multiple lambs and get back into condition for the next years mating.